I am somewhat ashamed to admit that I have very belatedly come upon Nana Fredua Agyeman’s blog, ImageNations . All I can say is mea culpa, and my searching skills should have been better. He does focus on literary goings on in Ghana, and Africa. My colleague blogger, Fiona Leonard, wrote very recently about a recent visit to the Ghana Book Trust in Accra. The headline “Where do books for Africa go to die?” says it all. The last time I went there – sometime last year – the situation was no different. I was looking for some “light” reading for students and for the library at work, and I did find a reasonable selection – both for the time I had to look, and for the money I had to spend! But I did have to scrounge through some large dirty boxes on the floor and a few shelves of non-textbooks. I do admit that I felt that GBT was definitely not what it used to be. First of all, there weren’t many people there; yet I emember occasions when it was full of students looking for texts to buy, as well as institutions hoping to supply their libraries. It was dark – maybe it always was, but I didn’t notice it, and definitely dingy looking. Definitely not a very attractive place to go. Yet, as was mentioned by Fiona, GBT continues to receive containers of books from donors in North America, although they no longer act as recipients of books for Book Aid International which has stopped working in Ghana and West Africa. So what has happened? And why? The word on the street is that some companies in the book trade were not pleased with GBT who were supplying many organizations at very low prices, but is this a reason for the lack of care? Thanks Fiona for saying what many of us should have said ages ago, and for being outraged! Thanks to Kajsa for the alert on Boakyewaa Glover’s forthcoming book launch, which is taking place on Friday 21 May 2010 at African Regent in Accra. Actually, her book, Circles, is already on sale. I have certainly seen copies in Silverbird at Accra Mall; not sure if I have bought it though. Just heard about the following, which might be of interest to those who are based in Accra. Center in the Center for International Affairs on Legon campus. 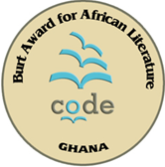 I have to admit that I have seen ads in the Ghanaian newspaper for CODE’s Burt award for African literature in Ghana, and I haven’t made any mention of it. Mea culpa! So here is the link to the specific CODE page and I think I should mention that the deadline is 31 May 2010. The local collaborating organisation is Ghana Book Trust, which in my view is somewhat moribund, or perhaps I should say, less active than it used to be. A pity, as it did help provide books to lots of institutions and community libraries. But maybe it was regarded as competition by booksellers? or was that just a piece of gossip which I heard, and am mentioning? I mentioned – in an earlier post – that I would list the next books for the Accra Book Club. All part of my selfless pr role???? The help, by Kathryn Stockett. I actually have several of the books, which makes me both pleased, yet feeling somewhat bereft that I wanted books that I wouldn’t necessarily thought of myself! For those who are interested. this batch will start in June 2010. If anyone wants more information about the ABC, do leave a comment here, and I will get in touch. I got an invitation to listen to Gina Loring – a young, contemporary, poet from the US – via an email from Franka Andoh, who runs Cuppa Cappucino. In a way my timing was perfect; though I was late, (the programme actually started on time at 5.30pm as advertised), I came to meet the invited guest just about to recite three of her poems. One a tribute to Lena Horne, another to her small cousin aged 18 months and other on the poems lying within so many people. On reflection they were really interesting, and I wish I could have heard more. But it was Friday evening, and the end of the last week of the semester, and the academic year, and I guess I was tired, so part of me wanted to stay and be sociable, and the rest wanted to go home. Regretfully, I say, looking back, I chose the latter. Got home, and there was no electricity, so there was no choice but to wash and go to sleep. But I was glad to have been remembered, and to have been invited. What I need to do more is to keep in touch and network afterwards, rather than excuse myself!